Across the world, two and one half billion people live with uncorrected vision, 80% of whom reside in low resource settings 1 . Beyond the cost of not being able to see the world clearly, uncorrected refractive errors (a major source of uncorrected vision) cost a global $227 billion dollars in lost productivity per year 1,2 . Further, an important correlation has been reported that 74% of the world’s 750 million illiterate adults have, at some point, failed one or more sections of a vision screening test 1. Children with uncorrected vision are also impacted by this preventable issue: poor vision during childhood is a common cause of low literacy across settings with limited resources 3 . Without correction, poor vision negatively impacts a person’s ability to work, study, and accomplish everyday tasks. The dire issue of unaddressed poor vision across the world has been receiving attention—but with few, if any, solutions that have taken off in the way that would be necessary to address this problem. Most ‘solutions’ to this problem have settled on providing eye care to certain cities across the globe, and many have resigned to forgoing eye care in rural populations 4 . As it stands, investments in corrective glasses are inadequate to meet the needs of the world’s poor: in 2015, less than one percent of the world’s total global health and development funds was allocated to addressing refractive errors 1. In 2015, only eight million glasses were distributed to the estimated two and one half billion people in low resource settings in need of corrective eyewear 2. A variety of social entrepreneurs, companies, and nonprofit organizations are actively working on innovative eye care solutions, but the high cost of corrective glasses and the need for staff training has limited impact to-date. Affordable and scalable solutions for improving eyesight across low resource settings worldwide are needed 5. A question that naturally follows is: what is not working in the current strategy of addressing such a major and global problem? A promising survey done on modern efforts to expand the net of corrective eye care poses a solution 4; the two major areas that current global health interventions in refractive errors have continued to stumble across has been the high cost of corrective eyewear and the lack of providing constant supplies in non-urban regions 1, 4. If an organization can find a way to circumvent these problems, the study argues, a large breakthrough in the fight against poor vision can be made 4. Currently, there exists one solution that has yet not been explored which has the potential to radically lower the cost of corrective eyewear and leap across the urban-rural divide. Instead of working within the frame-and-lens framework of current eyecare providers in the developing world (with the adjustment and specification of frames and lens necessarily driving up the cost of glasses), there exists a completely alternate realm of improving vision that has not yet taken off amongst global health policymakers: pinhole glasses. Pinhole glasses, are ‘glasses’ made from a solid sheet of material and regularly interspersed with uniform holes (Figure 1). The power of pinhole glasses, in their ability to increase the depth of field experienced by the user, comes from the stenopeic effect—an effect where light from objects is forced to pass through many very small holes, resulting in a clearer image on the retina regardless of the extent of refractive error (Figures 2 and 3 for visuals on how the stenopeic effect works). 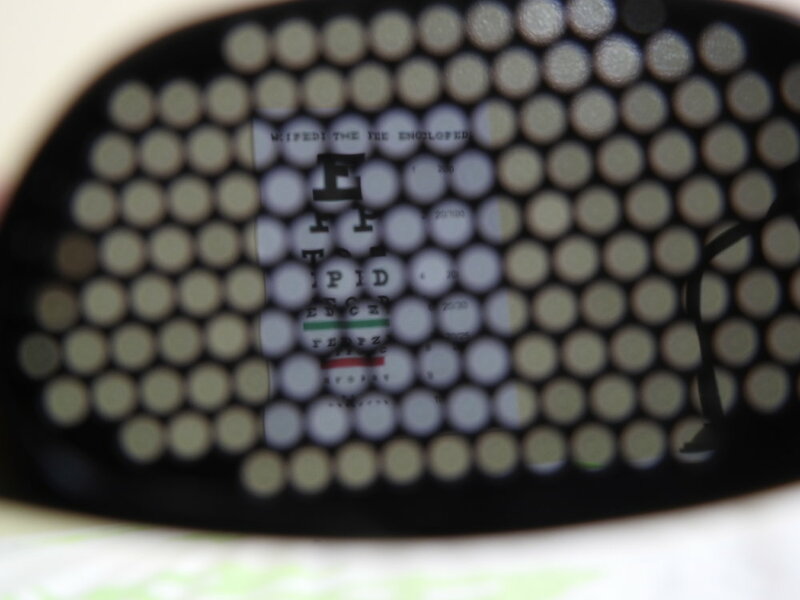 In a recent study, the efficacy of the stenopeic effect in improving vision was established: pinhole glasses can indeed improve vision among people with refractive errors 6. Across 48 subjects with refractive errors who normally wear conventional glasses, the use of pinhole glasses instead of conventional glasses (as compared to those with refractive errors wearing no glasses) caused significant improvements in distance and near visual acuity. The mean depth of focus (DOF) of pinhole glasses users increased by approximately 50% when compared to those with uncorrected vision 6. In short, “pinhole glasses improved visual acuity, DOF, and accommodative amplitude” 6. By not requiring specific adjustments for correcting poor vision (such as shaping lenses based on a visual acuity report), pinhole glasses are able to improve vision at a lower cost and more easily than conventional glasses. Beyond this, pinhole glasses do not need specialized training to use. In recalling the two major roadblocks to successful global health interventions in the problem of refractive errors—high cost and a lack of constant supply—pinhole glasses can possibly be made at a fraction of the cost of conventional glasses, and they can be made en masse by using set design templates (Figure 1). Although it has been shown that pinhole glasses can improve vision among people with refractive errors, this approach has not been widely acknowledged 6. To be sure, there is one salient example of the use of pinhole glasses in low resource settings. As part of a campaign to invest in innovative solutions, the non-profit organization Save the Children partnered with a Spanish education company, Santillana, to provide pinhole glasses to students in rural areas of Mexico 7 . Called ‘paper glasses,’ or pinhole glasses made on low-cost paper material, this approach was notable for its success in offering a solution to the problem of a lack of corrective eyewear in rural settings (Figure 4). 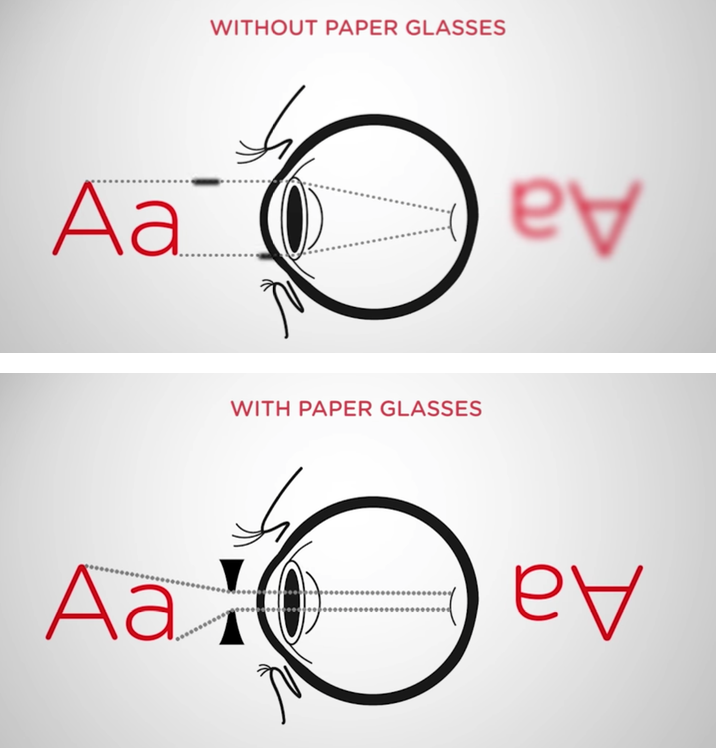 By placing paper glasses within the educational materials schoolchildren received, the Save the Children partnership was able to provide an improved degree of visual acuity to students who otherwise may have not received any form of corrective eyewear (Figure 5). Although advertised as a new way to improve poor vision globally, no other use or development of pinhole glasses for global health interventions can be found. In our own analyses, we brought the pinhole glasses solution to Siaya County, Kenya, and we spoke to local health workers, school teachers, and ophthalmologists about the possibility of implementing the pinhole glasses. From our own analysis, 2mm separation between the pinholes gave maximum visual correction, like that found in the Save the Children approach (their informative video discusses their approach to manufacturing pinhole glasses via laser-cutting into cheap materials, similar to our own approach in our prototype in Fig. 1; see References for video link). Discussions with multiple stakeholders made it clear that the burden of uncorrected refractive errors was high especially in rural settings, and that teachers can play a large role in the distribution of aids that can improve educational outcomes (like the pinhole glasses). Teachers in Siaya were interested in the pinhole glasses idea, and expressed frustration over the fact that conventional glasses were too expensive for many of the students—many of whom suffered from learning difficulties as a result of needing corrective eyewear but not having proper access to a solution. Healthcare workers also pointed out that “teachers may be our best bet for assessing which students need corrective eyewear the most.” Although ophthalmologists have seen a greater ability to penetrate rural areas in offering eye-screenings and glasses, they also recognize that the cost of conventional eyewear may be prohibitively high. Could pinhole glasses be the next ‘big thing’ of global health interventions bent on addressing the worldwide burden of refractive errors? Although the Save the Children approach seems promising, and our field study in Kenya has revealed significant interests and space for an innovative and cost-effective solution to current corrective eyewear, no sizable or long-term study of the efficacy of pinhole glasses in low resource setting has been done. Despite the presence of an important study outlining the significant improvements received by using pinhole glasses 6, no study has described and assessed the improvements within an adolescent population and over a long period of time. If pinhole glasses can be shown to be effective within low resource settings and not to have any serious side-effects in its long-term use, the future groundwork for a successful intervention can be established. The time to address this global problem has come, and without new strategies we may fail to breakthrough and offer corrective eyewear to the two and one half billion people around the world who suffer from poor vision. It is our hope that innovative solutions can be tested and investigated for their efficacy, in the goal of solving such a persistent problem. Dr. Pineda is a practicing ophthalmologist and faculty affiliated with the Massachusetts Eye and Ear Infirmary and Harvard Medical School. In addition to advancing the field of cataract surgery through his professional career, Dr. Pineda has led international efforts to expand affordable and quality eye care. He is the Director of the International Council of Ophthalmology, and has led two longitudinal clinical sites to improve eye care in Ethiopia and Sudan. Dr. Pineda is also active in Visionaries International and Orbis International, where he trains surgeons and ophthalmologists across the world. Jose, a graduate of Harvard College, is an incoming student in MIT Sloan's Masters in Business Administration program. With an interest in using technology to address global issues, Jose is the CEO of Z Imaging - a startup aiming to improve the practice of surgery through augmented reality. Grigory, a graduate of Harvard College, is an independent researcher exploring the intersection of biology and computation. In the past he co-founded Z Imaging, which uses augmented reality to help surgeons operate safer and faster. Kamran, a graduate of Harvard College, is a research fellow at the California Attorney General's office, where he specializes in healthcare. With an interest in global health that has driven him from researching low-cost diagnostic tools at Harvard to the city of Karachi where he studied public health systems through a Weatherhead Center fellowship, Kamran looks forward to a career at the intersection of public service and academia. World Economic Forum (2016). We’re Blind to the Global Cost of Poor Eyesight. Thurston, A., & Thurston, M. (2013). A literature review of refractive error and its Potential Effect on reading attainment in the early years of school. Optometry & Visual Performance, 1(1), 25-31. Holden, B. A. (2007). Uncorrected refractive error: the major and most easily avoidable cause of vision loss. Community Eye Health, 20(63), 37-9. Kim, W. S., Park, I. K., & Chun, Y. S. (2014). Quantitative analysis of functional changes caused by pinhole glasses. Investigative ophthalmology & visual science, 55(10), 6679-6685.